FenoLogica Biosciences works with the Pacific Northwest Research Institute to speed up scientific discoveries. QUICK STUDY: FenoLogica Biosciences CEO Sean MacLeod sees promise in a business model that uses cloud computing and high-tech hardware to accelerate laborious by-hand research. In 2016, Yoshinori Ohsumi won the Nobel Prize in Physiology or Medicine for his research in autophagy, a cell process that when disrupted or crippled, is linked to diseases like Alzheimer’s. FenoLogica Biosciences, a new startup in Seattle’s booming biotech space, wants to make it faster and easier for researchers like Ohsumi to uncover the important links between genetics and disease. The company claims its technology, which includes a custom camera and powerful cloud-based software, can perform in only five weeks — at a 95 percent cost saving — an experiment that took Ohsumi two years to complete. 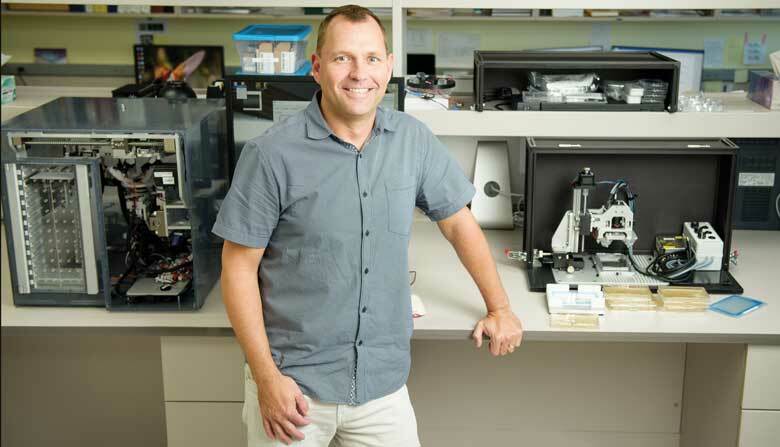 FenoLogica began with a partnership between CEO Sean MacLeod and the Pacific Northwest Research Institute (PNRI), a nonprofit biomedical research institution, to translate scientific discoveries in the laboratory to the commercial market. PNRI geneticist Aimée Dudley was improvising solutions in her lab to make the cell imaging necessary for her research move more quickly, and PNRI President/CEO John Wecker saw an opportunity to bring those innovations to a larger audience. He approached MacLeod in late 2015. MacLeod saw the potential for building a business model that combines the power of cloud-based computing with sophisticated hardware. PNRI provided seed funding and the company is about to begin testing a product prototype with five pilot customers. In an average experiment, researchers use a consumer digital camera to capture by hand images of 5,000 different samples. Scientists then upload, label and visually scan each image. FenoLogica automates data collection and analysis, reducing the chance of error, and it uses the cloud to offer researchers more analytical power. MacLeod estimates that the initial market in pharmaceuticals, agriculture and biofuels is a billion dollars or more, with a follow-on market in synthetic biology. The company plans to have a market-ready product by mid-2018.